Experience the results of our ground-breaking conservation initiative. Come with us on a glow worm tour, as we guide you through our purpose-built cave, filled with thousands of glowing glow worms! Glow Worm tours are walk-in only, and leave from our office every hour from 10:30 am onward. We offer the only opportunity in Queensland to see glow worms during the day, and over the course of 30 minutes, you’ll see a glow worm up close and learn all about their life cycle and behaviour. Our cave features a colony of native Mount Tamborine glow worms, and your admission helps support and ensure the survival of the species in South East Queensland for future generations! Our cave has been designed to maintain ideal conditions for our delicate glow worms throughout the year, providing the perfect environment for a healthy colony. This means you are guaranteed to see THOUSANDS of glow worms inside our cave all year round. The experience is one you have to see to believe! 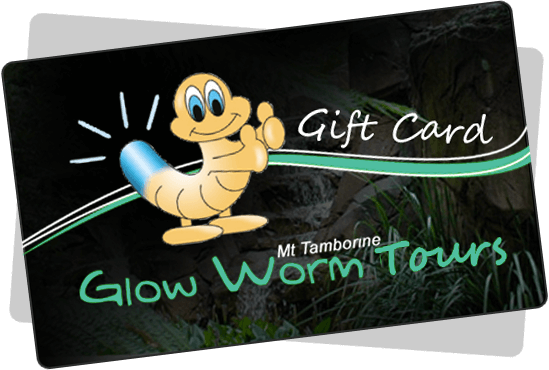 Give the gift of a Glow Worm tour to someone you love. Our gift cards are delivered instantly via email, and make the perfect gift for every special occasion. A Glow Worm tour is great for people of all ages! Glow worms require a permanently moist habitat for their survival and are therefore dependant on rainforests and wet caves for their continued survival. However, rainforest habitats in Australia are shrinking due to climate change and human impacts. Our purpose built glow worm cave at Mount Tamborine provides the ideal conditions for glow worms within a controlled environment, removing the impacts of decreasing rainforests. We have been coming to the Gold Coast for years to holiday but had never been up Mt Tambourine and were really glad we did. The Glow Worm caves were amazing and the kids loved it. Even I learned a lot more than I thought and the tour guide was very good. Recommend this to anyone and is a great getaway from the Coast. We loved the glow worm cave, it's amazing to see what they're doing for the future of the glow worm population and the application of glow worms in medicine. Great to see such an enthusiastic and passionate group of people doing work that is positively contributing. The cave was spectacular and hard to believe there are so many tiny little worms in there creating such beauty! We had a great day out at the Glow worm cave tour at the Cedar Creek Estate Winery. The winery itself is well set out with picnic tables and lot of local wildlife- Brush Turkeys, lizards etc. The Glow Worm cave tour was excellent and informative. Our guide was very knowledgeable and answered lots of questions. Amazing conservation efforts on a private property. We also went into the Frog's Hollow where there were great displays of and information on local frog species. We went as a family and had a lovely time. The caves were amazing and so lovely and magical to seeing our children's faces light up when we got into the dark of the cave and saw the Glow Worms. Was a great experience and something fun and interesting to do while on Tamborine Mountain. The Guides are full of information and the glow worms are certainly a sight to see. It's fairly inexpensive and doesn't take a long time. The gardens are also beautiful to view if you're waiting for your tour (they run every 30 mins). The tour was interesting and informative. Our guide was happy and enthusiastic when answering questions. The kids loved it. This glow worm cave is so awesome and it's an affordable and cheap attraction. I have never seen so many glow worms before, its a beautiful sight. Definitely worth a visit. Very nice and enriching experience. So Beautiful ! So glad we went and had a look ! We had a lovely tour in the glow worm cave this morning. Watched a short video about the glow worm and then had a tour inside. We were lucky we were the first ones there which meant we had a private tour of the cave, walking through the cave was surreal, really beautiful. It was really informative and the guide was really polite and friendly. Overall great experience. I was already enticed as by the name, 'Glow Worm Caves...' My partner and I did the tour and found it very informative. It's something unique and was great experience nonetheless. I suggest anyone in the area to check it out. Very informative and great idea to provide a safe home for the glow worms where we can see them without any danger to them - very clever. Staff were great and answered everyone's questions. Will visit again to see the colony grow. Located at Cedar Creek Winery, this man made glow worm cave is a must see for anyone. Just like looking at the night sky. Also a new frog hollow. Delicious restaurant and cellar door as well as picnic area. During our explore of the Tambourine Mountain area we decided to do the Glow Worm tour at Cedar Creek Winery, there were only 4 of us on the tour given school holidays are over and it was a week day. Harry was our guide and we had the most informative and funny tour. Probably helped that between the 4 of us we were like a bunch of clowns ourselves but Harry made the tour. If you're in the area go check it out well worth it. Very informative. Money well spent if you're the kind of person who enjoys learning about the odd creatures that share our world. Tour guides were very knowledgeable and friendly. I took my Nephews & Neices to the Glow Worm caves as I thought it would be an interesting & educational experience for them, I had explained that it would be very dark inside the cave but also safe. The guide was excellent, very informative and had a good sense of humour. I quizzed the children on our journey home and to my amazement they remembered everything that they had been told, this is a good sign that the tour was enjoyed. There is a Restaurant & Winery here with beautiful surroundings should you wish to have lunch or taste wines. Just been to see Frog Hollow and had the best time. We happened to be there when the frogs were being fed. The kids absolutely loved it. We got to see how the frogs push the crickets down into their stomach with their eyes. The frogs were actively chasing the crickets and leaping in and out of the water. The diversity of frog species was great. We loved the experience, but you need to be patient and look for the frogs. The more effort you put into looking for the frogs and observing them, the more you will get out of the experience. There are a lot more frogs there than you first realise. Add to that the glow worm cave and my kids (9 & 11) had a fun learning experience. A really lovely morning! Nov 14, 2018: The guide was amazing and had a fab way of making everyone feel included. Seeing the glow worms was fantastic. From the moment you enter the tree lined driveway, you'll appreciate a charming winery in picturesque grounds. Enjoy an entertaining wine tasting with the largest range of wines in the Hinterland, with something to suit even the most discerning palate. Our restaurant is a great place to relax and slow down, with stunning views and superb food. Art lovers will appreciate the diverse Australian scenes in the Arthur Hamblin Gallery. At Cedar Creek Estate you'll find Mount Tamborine attractions for the whole family, including our purpose-built Glow Worm Cave offering daily tours. Things to do are never in short supply - and we bring you the very best on the Estate. Sign up to our Newsletter for information, specials and deals. © 2019 Copyright Glow Worm Caves Tamborine Mountain. All Rights Reserved.